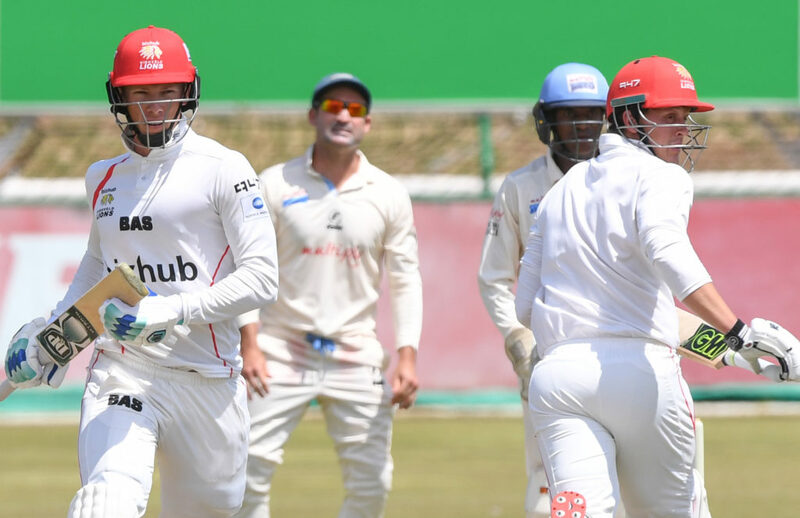 A competition record fourth-wicket stand of 350 between Rassie van der Dussen and Wiaan Lubbe helped the Lions dominate the opening day of the Jukskei derby again the Titans in Potchefstroom on Monday. Van der Dussen and Lubbe both hit big career-best centuries as the hosts recovered from 12 for three after winning the toss and batting to post a mammoth 385 for five by the close. Van der Dussen crunched 175 off 257 balls (26 fours, two sixes) – his 15th career ton and one that surpassed his previous best score of 166. Lubbe, meanwhile, notched up his maiden three-figure score at franchise level by making 166 (267 balls, 19 fours, 4 sixes), which was also the fourth century of his young career. Their partnership came after the inexperienced champions had rocked the top order through two wickets from Eldred Hawken (2-60) and one by Matthew Arnold (1-73) that had left the Lions in a huge hole after only 7.3 overs. Proteas pair Stephen Cook (0) and Temba Bavuma (10) were amongst the wickets to fall, prior to the recovery that saw Van der Dussen and Lubbe break a 12-year-old fourth-wicket record of 264 between Albie Morkel and Justin Kemp. The Titans did fight back late in the day when Clayton August (2-72) removed both set men, but day one of the derby undoubtedly went the way of the home side at Senwes Park. Mthiwekhaya Nabe claimed a career-best and maiden five-wicket haul for the Cape Cobras before Robbie Frylinck’s three-for helped the Hollywoodbets Dolphins storm back at the end of day one of their 4-Day Domestic Series clash in Cape Town on Monday. Rising young fast bowler Nabe claimed five for 60 as the visitors were bowled out for a seemingly below-par 225, but veteran Frylinck’s three for 20 sent the hosts tumbling to stumps at 45 for four. It meant the log leaders still trailed by 180 when an early close was drawn due to bad light at Newlands. For the KwaZulu-Natal side, their strong fightback represented good character after the doom and gloom they found themselves in early on day one. After throwing away a good opportunity to win their first match of the season when they went down to the Warriors in Durban last week, they again started poorly in the Mother City. The returning Proteas Test star Vernon Philander (2-34), fit again after being sidelined with an ankle injury since the tour to Sri Lanka back in July, struck in the third over by removing Vaughn van Jaarsveld for six. Top scorer Cody Chetty, who made 71 (10 balls, 14 fours), fought back with Sarel Erwee during a 75-run second wicket stand, but that ended on 90 when Nabe nabbed his first wicket by trapping the latter leg before wicket for 35. 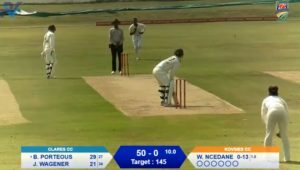 It was a regular loss of wickets from there as Nabe proved the thorn with his best figures since his four for 48 for Western Province against KwaZulu-Natal Inland in three-day cricket. He was well supported by Philander, who sent down 14.3 overs, Dane Piedt (1-25), Dane Paterson (1-44) and Tladi Bokako (1-53). Frylinck then dismissed Janneman Malan (6), Zubayr Hamza (17) and the in-form David Bedingham (0) – the latter two in success deliveries – to rock the Cobras. Okuhle Cele (1-5) added the scalp of Aviwe Mgijima, also for a duck, with Pieter Malan (18) left fighting a lone battle at the close. A maiden franchise century by Andries Gous helped the Knights recover from a disastrous start to reach a fighting 276 for eight after the opening day of their 4-Day Domestic Series encounter against the Warriors in Port Elizabeth on Monday. The 24-year-old, playing just his second match in four-day cricket, hit 135 (221 balls, 20 fours, 3 sixes), which was also the highest score of his career. He shared in a critical 159-run sixth wicket stand with Ryan McLaren, who was unbeaten on 74 by the close at St George’s Park. However, things should have been much better for the visitors after the big stand by the pair. They were on 253 for five but then lost three for 18 to allow the home side back into control with Anrich Nortje the chief destroyer thanks to his five for 65 – the fourth five-for of his career. 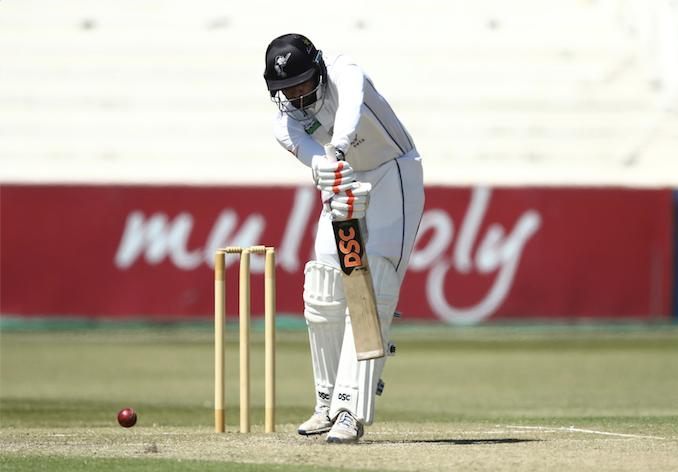 The day did not start well at all for the Knights after they had won the toss and opted to bat first as Nortje dismissed Luthando Mnyanda (0) second ball, before Keegan Petersen (3) fell from the ninth delivery of the morning. Grant Mokoena (10) and Rudi Second (4) also fell in quick succession, leaving the Central Franchise on 39 for four at one stage. Pite van Biljon (34) initially led the recovery, before Gous’ sixth career ton completed it. However, the new ball then undid most of the work with Nortje and Lutho Sipamla (2-61) putting the Warriors in the pound seat at the close.